This book is dedicated to my mother and father, Mrs. S. Seneviratna and the late Mr. D. A. Seneviratna. They made this book a possibility by giving me a Buddhist upbringing. May they attain Nibbaana. 1. The right time – The life span of human beings at a time a Buddha is born is between 100 and 100,000 years. If the life span is very short, human beings want to enjoy their short life to the fullest and tend to be very fond of material things. If the life span is very long, they tend to forget the impermanence of life. At this time the Bodhisatta found that the life span was one hundred and twenty years. 2. The right continent – All Buddhas are born in India (known as Jumbudipa at the time of the Buddha). This is because the people of India are spiritually more advanced than people in other countries, and so are more ready for a Buddha. 3. The right area – The city of Kapilavatthu was chosen as the city of the future Buddha, as there was a just and good king and many righteous people living there. 4. The right caste – A Buddha is always born in a high caste – Either a royal caste or a priestly caste. This is necessary, as often persons born in a low caste are not accepted by society. 5. The right mother – The mother of a Buddha has to be very pure. She is a person who has resolved to be a mother of a Buddha and observed the five precepts for many countless past lives. The chosen mother was Queen Mahaa Maayaa, wife of King Suddhodana of Kapilavatthu. (1). Bodhisatta – One on his way to perfection. This is the name given to a person who is trying to be a Buddha. (2). Tusita Heaven – One of the seven happy planes of life. The Devas in the Tusita Heaven have a life span of 576,000,000 human years. All Bodhisattas who have completed the ten perfections await the right time for their last birth in Tusita Heaven. 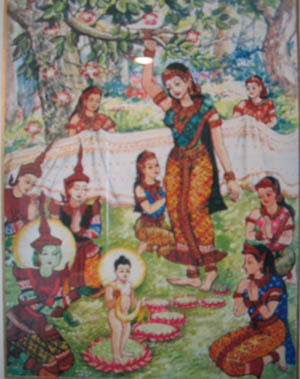 The next Buddha, the Maithreya Buddha, is at present a Deva by the name of Natha in the Tusita Heaven. (3). Devas – Heavenly beings known in English as gods or divine beings. The next morning she told King Suddhodana of her dream. He consulted some wise men who, on hearing the dream said, “The Queen will have a wise and noble baby boy.” The king and queen were very happy for they had no children and were longing for a child. The ministers took the Queen and the baby back to Kapilavatthu and King Suddhodana. Many wise men came to see the baby. They said that one day the Prince would either be a King of the world or a Supreme Buddha. The baby Prince was named Siddhaartha Gotama. Siddhaartha means “wish fulfilled” and Gotama was His family name. Seven days after the birth of the Prince, Queen Mahaa Maayaa died. She was born as a Deva by the name of Matu-deva putta in the Tusita Heaven. 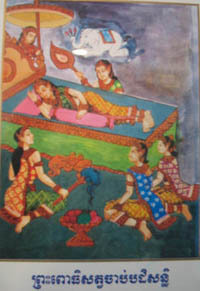 Her sister, Mahaa Prajaapathi Gotami, took care of the Prince.